Renaissance villa in the heart of the Mugello, 35 km from Florence. Property 31: Renaissance villa in the heart of the Mugello, 35 km from Florence. Casa Camomilla A: A pleasant and spacious two-story independent house surrounded by meadows and by green hills, with Free WI-FI. Property 38: Casa Camomilla A: A pleasant and spacious two-story independent house surrounded by meadows and by green hills, with Free WI-FI. We thoroughly enjoyed our stay. The whole area was kept tidy and clean. Would be nice with a washing machine at site, but there is a good laundry self service in Sieci just a few doors away from the best ice cream in Italy. Would go back and definitely recommend the place. A little bit of rustic charm. 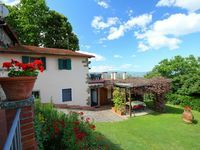 This is a very comfortable, quiet home overlooking the Tuscan valley below. Pool was wonderful on 80 degree days, wifi was excellent outside the thick stone walls of the house. Very nice couple with a couple of little kids living on the property and taking care of the place. All in all a very enjoyable stay.